This audiobook version of Hunting Badger was published in 1999 by Recorded Books, Inc. It contains 4 audiocassettes (6 hours listening time) with the unabridged novel narrated by George Guidall. The cassettes are in a hard plastic case. 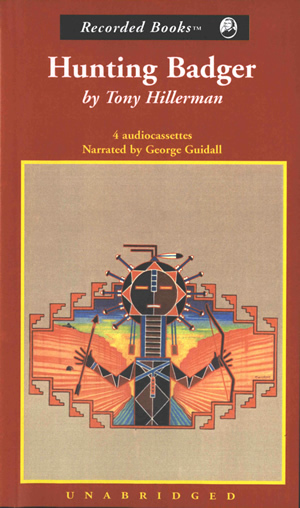 The cover art is the original illustration by Peter Thorpe from the first edition and features a Yei figure in shades of brown and blue, holding a bow and arrow, with orange canyon walls receding into the background below a multicolored sky. The back of the case, with black printing on white, has text describing Tony Hillerman's work as well as the content of the novel and narrator biography. The spine of the case is white, and has the novel title and author name printed in red. The publisher's imprint is at the top of the spine in black.